I love history and there are several eras that I find especially interesting. The Celtic history is one of those. I have always found the Celts interesting – the love of nature, beautiful artwork and manuscripts and fascinating myths. 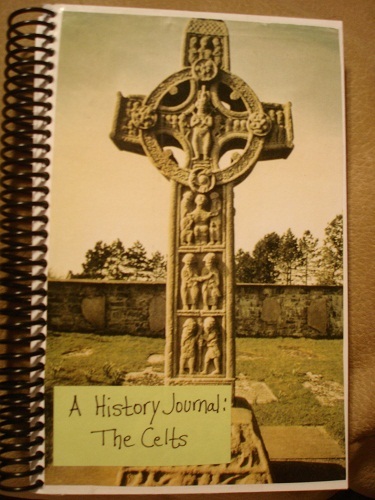 This journal is all about the Celtic Spirit. Share your thoughts in words or pictures. Feel free to use any medium, just don’t alter anyone else’s work. I hope you like this journal, and if you would like a copy of it, just let me know and I’ll be happy to scan it and send you a copy. Otherwise, please make sure to re-list the journal after your entry and keep the journal circulating. Much work goes into creating journals and it’s a shame when one gets lost or is kept by someone other than the creator. When the journal is full, please return to Jenny Stafford, jfit, 2100 Manassas Drive SW, Huntsville, AL 35803, or let me know it’s full and I’ll mooch it from you!